We flew into Cusco, and from there, we traveled by car through the region’s famous mountain: the Andes. Shrouded by clouds, the snow-capped mountains disappeared and reappeared before our eyes. We stopped to admire the beauty of the ‘Sacred Valley of the Incas’, our first stop, before the next town to catch the train to Machu Picchu. Earlier that day, I suffered some discomfort from the high altitude that I was prompted to ask our guide if there was another route to Machu Picchu. But after being treated to a grand vista overlooking the Sacred Valley, the train ride and the exhilarating bus ride of a hairpin turn after hairpin turn between granite rocks and the mighty green mountains to reach Machu Picchu, I was reminded of the saying, “It’s not about the destination, but the journey”. 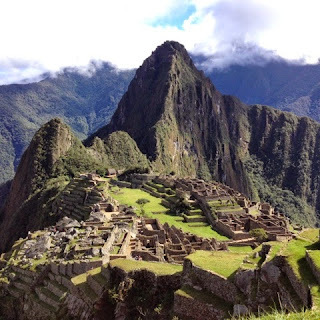 However, Machu Picchu was certainly a destination – the Inca’s idea of heaven. Nothing could have prepared me for the sight as we reached the “PARK”. Our guide walked and talked us through temples, houses, stone and steep terraces and ramps. I returned the following day to climb the highest peak and experience the most astonishing view. The scale of what the Incas created, this mystical place at a height that cuts through the clouds, boggled my mind. Machu Picchu was built in the 15th century and was abandoned when the Spaniards conquered the Inca Empire in the 16th century. The archaeological complex was made known to the outside world in 1911. The “PARK” is officially called “The Historic Sanctuary of Machu Picchu”, a UNESCO World Heritage Site. The park covers 32,592 hectares of mountain slopes, peaks and valleys surrounding its heart, the spectacular archaeological monument of “La Ciudadela” (the Citadel) at more than 2,400 meters above sea level. It is recognized as among the greatest artistic, architectural and land use achievements anywhere and the most significant tangible legacy of the Inca civilization. Click HERE to watch the video on You Tube or click the thumbnail below.